A delicious alternative to chicken noodle soup. 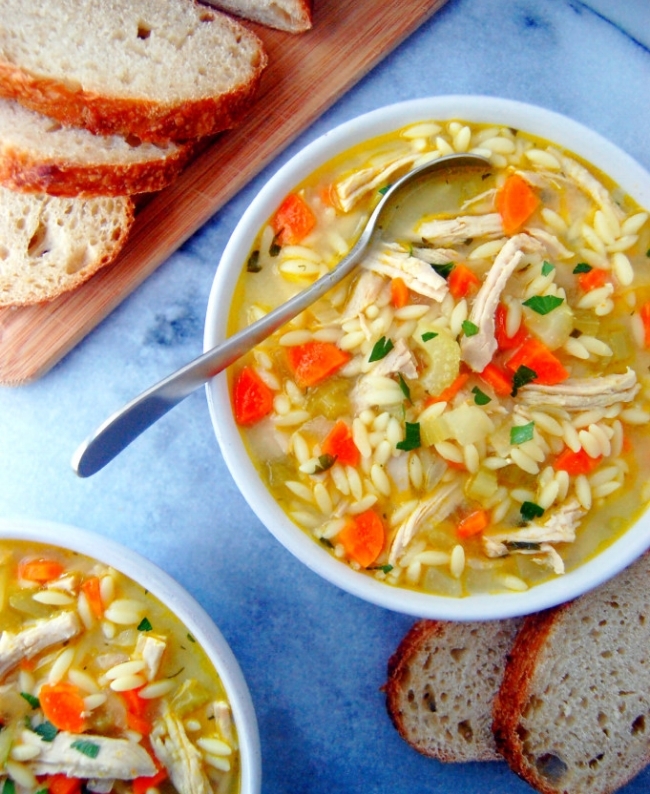 The orzo and shredded turkey bring exciting, new elements to your bowl of soup, and the lemon makes it all TO DIE FOR. Save this one for a chillier week in winter. Dice onion, carrots, and celery hearts. You should get about 2 cups diced onion, and 1.5 cups each of diced carrots and celery. In a soup pot, add diced vegetables along with 2 tablespoons olive oil and sauté for 5 minutes on medium heat. Mince garlic cloves and add them to the pot, sauteeing for 2 minutes. Add in turkey breast cutlets (thinly sliced raw turkey breast), broth, and dry pasta. Bring the soup to a simmer and then allow it to cook for 15-20 minutes. Test the orzo pasta for doneness before turning off the heat. Remove the turkey meat and shred it using 2 forks and then return it to the pot. Add in the lemon juice and fresh parsley. Stir to combine and serve hot in 2 cup portions. Add additional liquid when reheating leftovers of the soup as the orzo pasta will absorb additional liquid. Soup can be frozen for up to 3 months in freezer bags in 2 cup portions. If you are using leftover shredded turkey (about 3 cups is recommended), add the cooked meat during the last 5-7 minutes of cooking.